A complete brief guide of first aids for the Brown Recluse Spider venom follows: (read full article here). First, apply ice on the injury in order to lessen the pain and swelling. Whenever possible, place the bitten part of the body above your heart. Wash the entire area with cool water and soap -do not use warm water. Put sterilized bandages on the injury. Stay calm --nervous states help the venom spread inside your body. Try ibuprofen, naproxen, or similar anti-inflammatory drugs to relieve the pain. HEAT: Keep the injury away from it (heat accelerates tissue destruction). Hydrocortisone cream or other steroids are forbidden. Do not try to remove the brown recluse spider venom with cuts or using suction devices. The medical treatment for the bite of a brown recluse spider involves Tetanus immunization, Pain relievers, and proper medication such as antibiotics and antihistamines. The bites of the “Recluse Loxosceles” of North America and the “Laeta Loxosceles” of South America are the most dangerous. The poison contains enzymes that are also part of the snake’s family poison such as hyaluronidase, phospholipase, phosphohydrolase, esterase, alkaline phosphatase and protease. Considering that there are some differences in the poison of all species as well as differences concerning the amount of poison injected by the species, clinic cases often go from slight to serious levels: the serious cases of dermatonecrosis and coagulopatias are weird and uncommon; death is rarely seen and victims are mostly children. However, this spider is very popular since many people with serious damage on their skins needed grafts and plastic surgeries and some children even lost important facial parts. 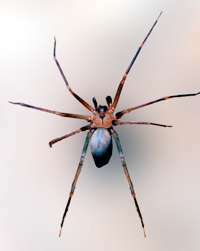 The Recluses bites are often located in the lower members. These spiders tend to bite only the people who mess with them. The bites on faces and hands are also very common in human beings. Generally, the bite is painless and its consequences appear later and they are not related to the bite of the spider. It can also cause local pain or stinging, followed by a blister surrounded by swollen skin of 1-2 cm. Pain can be slight at the very beginning and increase gradually. The appearance of a blue halo around the injury may suggest loxoscelism, indicating haemolysis or cyanosis. Later, it turns into small and deep damage stretched along the skin. The ulcer can grow as wide as 20 cm (8 inches) and it is covered by a crust. If this happens, plastic surgery will be needed with the aim of replacing the grafted skin. In the most serious cases, there may be high temperature, muscle pain and a hemolytic anemia with haemoglobinuria (red urine). It can also be followed by kidney insufficiency. We can add hemorrhages due to the consumption of the blood coagulation facts, though this is usually seen only in 10% of the cases, mainly in kids and old people. In this situation, the mortality rate hovers around 25%. The diagnosis of the recluse bites is not easy, since the contact with the spider can be ignored if it has not been seen. The first symptoms do not help the treatment in view of the fact that, at the beginning, the damage does not seem serious and it takes hours- even days- to see the real problem. There is not much to do to solve this problem. One possible option is to get the diagnosis as quickly as possible and to isolate the patient: if he/she is taken to hospital within the first 8 hours it will be possible to extract the wound with surgery. After 8 hours, the injury gets worse and bigger. But as we said at the beginning, diagnosing is not easy, even in hospitals. Browse the links in the menu for specific inside aspects of this specimen.